Oxidative stress is postulated to be responsible for the postprandial impairments in vascular function. The purpose of this study was to measure pulse wave velocity (PWV) and markers of postprandial oxidative stress before and after an acute bout of moderate exercise. Ten trained male subjects (age 21.5 ± 2.5 years, VO2 max 58.5 ± 7.1 ml kg−1 min−1) participated in a randomised crossover design: (1) high-fat meal alone (2) high-fat meal followed 2 h later by a bout of 1 h moderate (60% max HR) exercise. PWV was examined at baseline, 1, 2, 3, and 4 h postprandially. Blood Lipid hydroperoxides (LOOHs), Superoxide dismutase (SOD) and other biochemical markers were measured. PWV increased at 1 h (6.49 ± 2.1 m s−1), 2 h (6.94 ± 2.4 m s−1), 3 h (7.25 ± 2.1 m s−1) and 4 h (7.41 ± 2.5 m s−1) respectively, in the control trial (P < 0.05). There was no change in PWV at 3 h (5.36 ± 1.1 m s−1) or 4 h (5.95 ± 2.3 m s−1) post ingestion in the exercise trial (P > 0.05). LOOH levels decreased at 3 h post ingestion in the exercise trial compared to levels at 3 h (P < 0.05) in the control trial. SOD levels were lower at 3 h post ingestion in the control trial compared to 3 h in the exercise trial (0.52 ± 0.05 vs. 0.41 ± 0.1 units μl−1; P < 0.05). 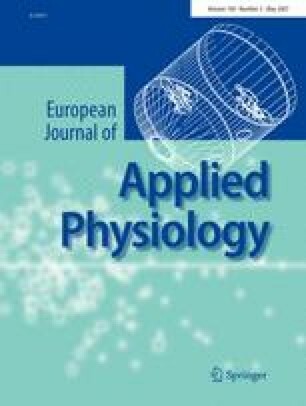 These findings suggest that a single session of aerobic exercise can ameliorate the postprandial impairments in arterial function by possibly reducing oxidative stress levels.